Our Model CK-3000 provides reliable, accurate, and easy to read time keeping features. Operation is simple and straight forward, with no menus to mess with. The CK-3000 can be used as a large Countdown Timer to display time remaining, or it can be used as a Count Up Timer to display elapsed time. It can also function as a time of day clock. Whether you're counting time up or counting down, the CK-3000 is the perfect choice for your timekeeping needs! Very simple and easy to use! The CK-3000 can be used right out of the box within minutes! Maximum Timing: 99 Hours, 59 Minutes, 59 Seconds. The CK-3000 can be set to any time within this range. Count Down Timer mode displays time remaining - essential for many applications. A wired and ultra reliable Remote Control is included. It features buttons for setting Hours, Minutes, and Seconds time set, Stop-Start, Timer Reset, and Timer Clear. Easy to use! No menus to fuss with - a total "no brainer" to use! Simple. U.L. listed 9 VAC wall adapter included. 60 Hertz AC line frequency time base provides high reliability and accuracy. Value Bonus: It can also function as a digital clock - nice! Audible & Visual Alarms: The timer momentarily beeps and the LED display flashes at the end of a timing cycle. Beep signal can be turned on or off for silent operation. Weight: Only 2.0 lbs. - Lightweight and Portable! Desktop, shelf, or easily wall mountable. We stand by our products with excellent service and pride. Flexible Operation! The CK-3000 has a versatile choice of Two Power Input Jacks: One on the back and one at the bottom of the case. 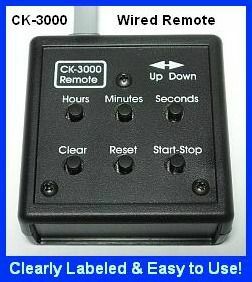 The CK-3000 Count Up or Countdown Timer can be mounted on a wall, or simply placed on a table, desk, or shelf. It's a Timer and a Clock! When it's not in use as a timer, you can use it as a time of day clock. With a simple press of a button, you can easily switch between timer and clock modes at any time. Very versatile! ATTENTION INDUSTRIAL USERS: We also offer a HEAVY DUTY REMOTE CONTROL for Industrial use. Scroll down for more information! 100% User Friendly with Nothing to Learn - Clearly labeled, simple, and a "no brainer" to use! No complicated menus, no beeps, no squeals. SIMPLE & EASY! Top Row: Hours, Minutes, and Seconds for setting. REMOTE CONTROL NOTE: The CK-3000 remote control is equipped with a detachable 7 foot long cable. For longer remote operation, we also offer a 25 foot cable for an additional $6.00. Order Model MK-95 Remote Cable. CK-3000 OPERATING INSTRUCTIONS: Click Here to see the one page instruction sheet. Simple to use! Looking for a timer with a Heavy Duty Remote Control? The CK-340 Industrial Digital Timer is a version of the CK-3000 with an extremely rugged remote control. We also offer special function PLC Compatible Timers. This is functionally equivalent to the CK-3000. Contact us for assistance. We Proudly Stand By All Our Products! Your satisfaction is fully guaranteed. You will not find a better value in a Large Display LED Timer. If you do find one, ( but you won't! ), we want to know about it! CK-1 LED Digital Desk Clock : 0.56 Inch LED display. Hours - Minutes - Seconds, 12 or 24 hour clock. CK-1000 LED Digital Wall Clock : 2.3 Inch LED display. Hours - Minutes - Seconds, 12 or 24 hour clock. CK-2 Time Zone Clock : 0.560 Inch dual LED display, six digits. CK-3 Desk Count Up / Countdown Timer : 0.56 Inch LED Display, Six Digits. CK-36 Desk Count Up Timer : 0.56 inch LED display - counts Hours, Minutes, and Seconds. CK-350 Large Digital Count Up Timer : 2.3 Inch LED Display, Six Digits. CK-4000 Large Stopwatch Timer : 2.3 Inch Display: Minutes, Seconds, & Hundredths of Seconds. 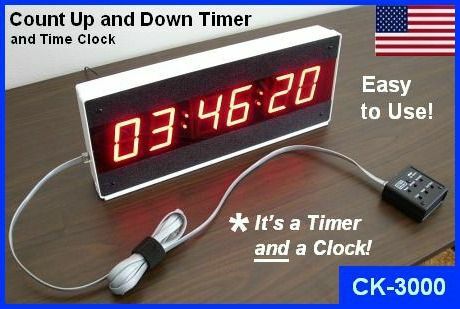 CK-5000 Large Event Countdown Wall Clock : 1.75 inch Display shows DAYS, Hours, Minutes, & Seconds. CK-6 Digital Day Counter Clock : 0.56 inch Display shows DAYS, Hours, & Minutes. 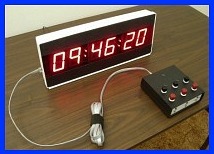 CK-46 Stopwatch Lab Timer : 0.56 inch LED Display with Minutes, Seconds, & Hundredths of Seconds.